I don’t know about you, but half the reason I sew is because the rest of the time I seem to be glued to a computer. Sewing gives me that tactile, useful feeling that you get when you actually make something with your hands. Somehow making things on a computer just doesn’t give the same experience, does it? Well, over here we all agreed that we want someone friendly to keep us company while we’re attached to our computers. These cute little guys are also hard workers; they cushion your wrists while you’re spending all that time at work. 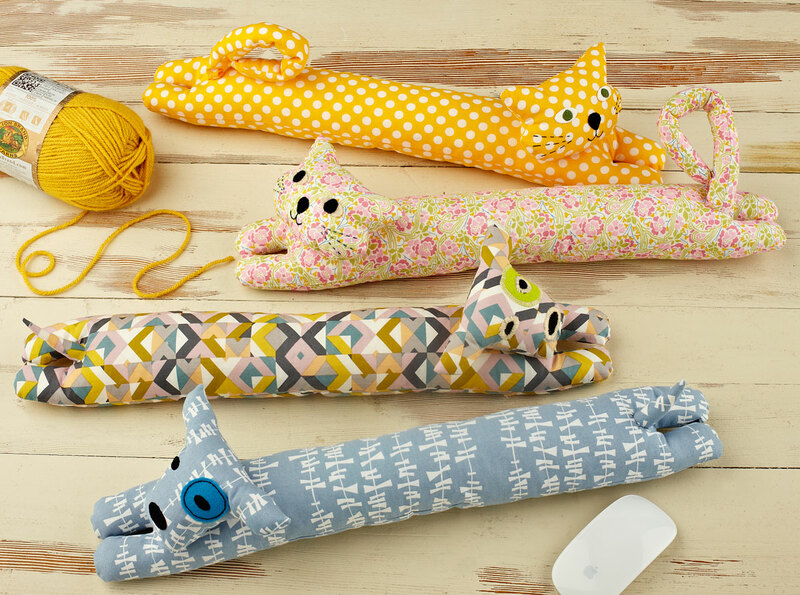 Plus, you can make them at the end of the day, to reward yourself with a little hard-earned sewing time! 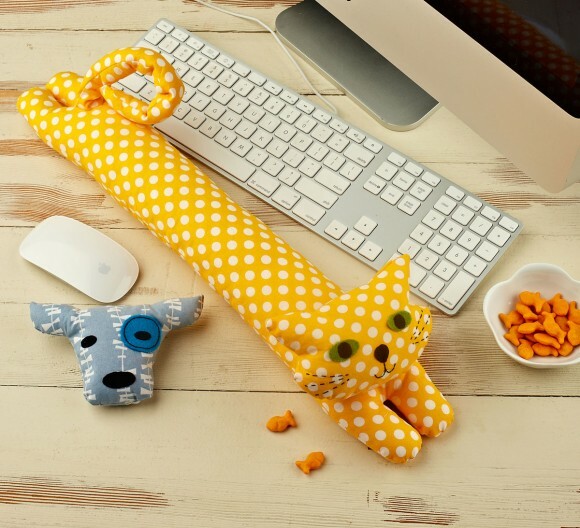 If you need just a little friend to help you and your mouse, just the cat or dog head will be a great addition. 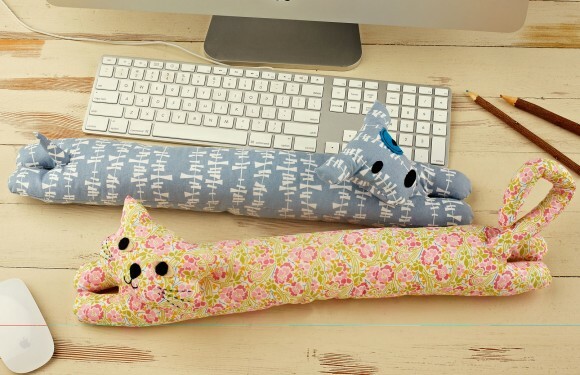 If you want the full experience and want a little typing support in the process, the full cat or dog will happily hang out with you, offering physical support (and emotional, if needed!) during your workday. You can make the dog with just a fat quarter and a few fabric or felt scraps for the face. The cat takes a little more fabric (cats are little divas, after all), with 3/8 of a yard. These are really easy to make, and our testers all mentioned how much their kids like them, too! In fact, several testers mentioned how they would make great draft stoppers if you lengthen the body to the width of your door. We used ordinary stuffing for our animals, and it’s also really fun to add little plastic pellets (or even some dried beans or rice, maybe?) to give them a bit of weight. Cat and dog headed beanbags? Why not? These guys are friendly and up for any games, especially after hanging out with you at the computer all day. They deserve a little recreation time too, right? The Desktop Pets Wrist Rest pattern is available now in both paper and digital format in the shop. I love these. They are so cute. So cute, Liesl 🙂 I think these would also be great filled with rice and heated in the microwave for a comfy neck warmer. Ollie is a major cat lover and would love the kitty one! Sooooo cute! I absolutely ADORE the puppy one!